Volvo City Safety is an autonomous emergency braking system designed to help a driver avoid a low-speed crash or to reduce its severity. At vehicle speeds between 3.6km/h and 30km/h, City Safety uses a lidar (Light Detection And Ranging) sensor positioned at the top of the windscreen to monitor an area 10m ahead of the car for vehicles which might present a threat of collision. If a collision is likely, City Safety first pre-charges the brakes and makes the Emergency Brake Assist system more sensitive so that, if the driver should notice the risk, the car is ready to respond more quickly to his braking action. However, if the driver still takes no action and a collision becomes imminent, City Safety independently applies the brakes very hard. If the relative speed between the car and obstacle is less than 15km/h, the car will be able to brake such that the collision is avoided. At higher relative speeds, City Safety will not be able to prevent the collision but will reduce the impact speed. If the driver intervenes to try to avoid the accident, either by accelerating hard or by steering, City Safety will deactivate. City Safety is unusual for an autonomous emergency braking system in that it does not give the driver a warning of the impending collision, and brakes very hard, very late. This is intentional: the way in which the system intervenes is not comfortable and drivers will not become reliant on it to avoid around-town accidents. 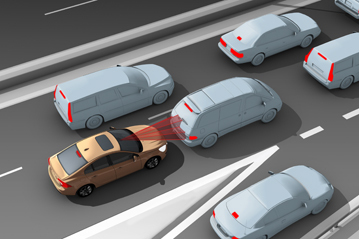 Volvo City Safety is a technology designed to mitigate and, in certain circumstances, avoid low speed rear-end collisions with vehicles which are stationary or travelling in the same direction. Rear end collisions are extremely common. According to some estimates, around a half of all accidents involve a rear-end collision. City Safety operates only up to 30km/h so focuses on the sorts of rear end collisions which take place during urban driving. Fatal and severe injuries are not common for car occupants in accidents below 30km/h. However, soft tissue ‘whiplash’ injuries are frequent, not only for the occupants of cars struck from behind but also for those in the striking vehicle. It is estimated that City Safety could provide a useful benefit (i.e. avert or mitigate the accident) in more than a half of all rear end collisions, and almost a fifth of all car to car collisions. City Safety is turned on by default at the start of each new journey but can be switched off by the driver. If it switched off, the system defaults on again at the beginning of the next journey. City Safety functions only between 3.6km/h and 30km/h, so will not assist in accidents at ‘highway’ speeds. Its lidar can detect vehicles which are at a standstill or which are travelling in the same direction and works at night as well as during the day. However, the sensor is compromised if it is covered by dirt or snow, or in adverse weather conditions such as thick fog or heavy rain. To mitigate this, the sensor is sited in the area which is swept by the windscreen wipers. Volvo undertook extensive tests, both on a test track and on roads, during the development of City Safety. On the test track, the efficiency of the system in identifying ‘true positive’ events (i.e. those situations which represent a real risk of collision) was established: cars were driven at different speeds and with different degrees of overlap at ‘dummy’ vehicle rear ends. In each case, it was established whether or not the system had responded correctly: whether the braking system was precharged at the correct time and whether the collision was avoided or the desired speed reduction achieved before impact. Road tests were done to ensure that the system did not perceive a threat and apply the brakes in benign situations. The system has also been independently evaluated, especially with regard to driver reaction and acceptance, and has been found to increase the perception of safety.